New Delhi, April 11 (Reuters): As night fell on the bucolic northernIndianhamlet of Mahaban, Gopi Chand Yadav gathered blankets and a flashlight to spend the night sitting on a wooden platform in his field. His task: to use bamboo sticks to ward off stray cattle from intruding and eating a maturing mustard crop. Like Yadav, many thousands of farmers stay awake to guard their farms over a cold winter or face losing their crops to the cattle – a double whammy for growers already reeling from a plunge in Indian crop prices. While stray cows ambling around towns and villages have always been a feature of life in rural India, farmers say their number has increased sharply in recent years to the extent that they have become a menace, and blame the policies of Prime MinisterNarendra Modi’sHindu nationalist government. Protecting cows – considered sacred to Hindus – was one of the measures meant to shore up support in the heavily populated, Hindi-speaking belt across northern India that has been a heartland of the ruling Bharatiya Janata Party’s (BJP). Instead, it is creating a backlash, even among Hindu farmers. “We already had enough problems and now the government has created one more,” said octogenarian farmer Baburao Saini from Kakripur village, about 85 kilometres (50 miles) from New Delhi. More than 50 farmers Reuters spoke to in Mahaban and nine other villages in Uttar Pradesh state said they would think twice before voting for Modi’s BJP in the next general election, due by May. The cattle issue and low farm prices are major reasons behind their disillusionment with a party that most say they voted for in the last election in 2014. Modi swept Uttar Pradesh at that poll, winning 73 of 80 seats in India’s most populous state, with rural voters swayed by a promise of higher crop prices, and as Hindu farmers supported the BJP amid tensions with the minority Muslim community. Modi is trying hard to claw back support among India’s 263 million farmers and their many millions of dependents after the BJP lost power in December to the opposition Congress in three big northern states where agriculture is a mainstay. Indian farmers keep cows to produce milk, cheese and butter, but to harm or kill a cow, especially for food, is considered taboo by most Hindus. Most states in India have long outlawed cow slaughter, but after coming to power in 2014 the BJP ratcheted up its distaste for trade in cattle, launching a crackdown on unlicensed abattoirs in Uttar Pradesh and on cattle smuggling nationwide. 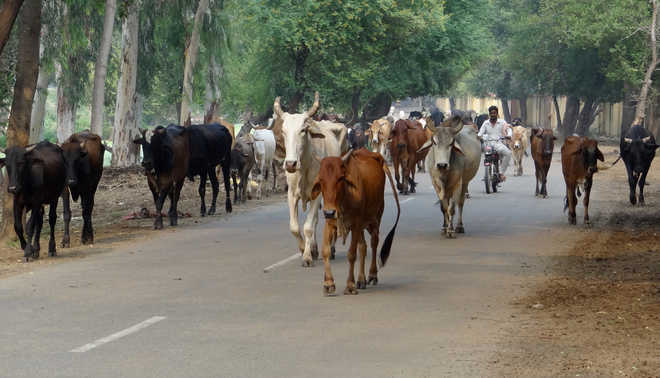 At the same time, a wave of attacks on trucks carrying cattle by Hindu vigilante groups has scared away traders, most of whom are Muslims, bringing to a halt the trade even in bullocks, which are not considered sacred. Rising sales of tractors and increasing mechanization mean that more animals are redundant for use in farming. The farmers Reuters spoke to said they revered cows as most devout Hindus would, but a sudden halt in the trade of cattle had hit the rural economy. In their view, the government should come up with more cow shelters and let cattle traders deal in other animals without fear of attack. Fodder prices have gone up by more than a third in the past year and most farmers cannot afford to keep cows after they stop producing milk, said farmer Rajesh Pahalwan as he smoked a hookah pipe in the village of Manoharpur. Six farmers sitting with him mainly nodded in agreement. In India, the world’s biggest milk producer, about 3 million cattle become unproductive every year. In the past, Hindu farmers would sell unproductive cows to Muslim traders and about 2 million of these would end up smuggled to Bangladesh for meat and leather. But that trade has now been throttled by the government crackdown, trade and industry officials say. That has led to many unproductive cattle being abandoned, farmers said, but governments – both state and federal – have failed to construct new shelters, leaving rising numbers of stray cattle that are feeding on crops, or even garbage. The government did provide some relief in its interim budget last week as it announced a cow welfare programme costing 7.50 billion rupees ($104.6 million) in the year beginning April. But there are hardly any “adequate measures to rehabilitate” cattle, said Fauzan Alvi, vice-president of the All India Meat and Livestock Exporters Association. “Forget about cows, we cannot sell even a single animal to even our relatives, thanks to cow vigilante groups which are aided and abetted by the BJP,” said the wheat farmer Chaudhary. Modi has in the past condemned violence by cow vigilantes, but critics and opposition politicians say some of the right-wing Hindu groups involved have links to his party, a charge the BJP denies. Nearly 85 percent of India’s farmers own less than 2 hectares (5 acres) of land, so even a relatively small area damaged has a big impact on their livelihood. Only two weeks ago, some cattle ravaged an acre of wheat grown by farmer Chandra Pal in the Mathura district of Uttar Pradesh. “My investment went down the drain after some stray cattle trampled and ate up the crop,” he said. Many farmers in Uttar Pradesh are now using barbed wire to stop animals from entering their farms, but that is expensive.